Like many people in boxing, Terence Crawford didn’t know Julius Indongo existed this time a year ago. Crawford already owned the WBC and WBO super lightweight titles, was a two-division champion and was considered one of the best boxers in the world. Indongo was an anonymous Namibian, unbeaten but unknown outside of his small home country in western Africa. It wasn’t until Indongo upset then-unbeaten IBF 140-pound champion Eduard Troyanovsky by first-round knockout December 3 that Crawford – and essentially everyone else in boxing – took notice. Indongo emphatically announced his arrival at the championship level with his one-punch, 40-second knockout of Troyanovsky (26-1, 23 KOs) eight months ago in Moscow. The 34-year-old Indongo became an attractive option for the 29-year-old Crawford, his opponent Saturday night in Lincoln, Nebraska, when he traveled to Glasgow, Scotland, for his following fight and out-boxed former two-division champion Ricky Burns (41-6-1, 14 KOs) on April 15 to win a unanimous decision and added the WBA super lightweight title to his resume. “We wanted the Ricky Burns fight at 140 as well,” said Crawford, who beat Burns by unanimous decision to win the WBO lightweight title in March 2014. “They didn’t wanna take the fight that soon. They wanted to take the fight with Indongo, and then perhaps later in the year we could’ve made a fight between me and Ricky Burns again. Crawford (31-0, 22 KOs) and Indongo (22-0, 11 KOs) will fight to become boxing’s first fully unified champion in any division since former middleweight champion Jermain Taylor held the IBF, WBA, WBC and WBO 160-pound championships 12 years ago. 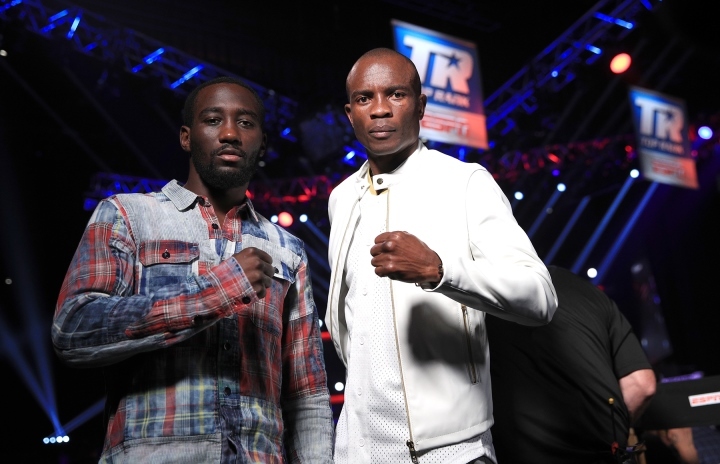 ESPN will broadcast Crawford-Indongo as the main event of a doubleheader from Pinnacle Bank Arena in Lincoln. The telecast is set to start at 10 p.m. ET/7 p.m. PT with a 10-round light heavyweight bout between top contender Oleksandr Gvozdyk (13-0, 11 KOs), a former Ukrainian Olympian who resides in Oxnard, California, and Craig Baker (17-1, 13 KOs), of Baytown, Texas. Tell me Atlas, Smith and Bradley ain't working this fight please ? I can't bare Atlas and Smith, Bradley is solid. Indongo's the real deal. 18/2 on betfair is a good bet.